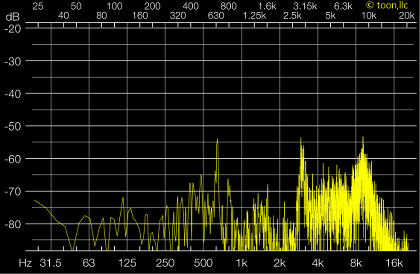 toon|Audio Frequency Analyzer RTA Support - toon,llc. "Audio Frequency Analyzer" uses our proprietary signal processing technology to analyze incoming audio signals and provides a precision frequency response measurement and spectral visualization. 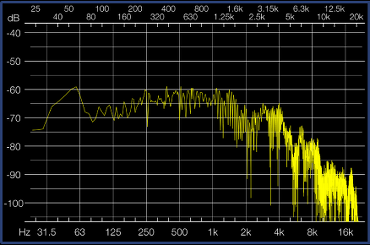 In the frequency range of 20kHz from 20Hz, the response of the measurement frequency can be displayed in the logarithmic FFT scale or 30 split band scale of 1/3 Octave. In the latest version, the 1/3 octave band calibration is now available. By adjusting the characteristics according to the external microphone used, high accuracy measurement can be realized. Please to click the following link to download "Audio Frequency Analyzer" from App StoreTM. It will be open the download page on App StoreTM. iPhone is a trademark of Apple Inc., registered in U.S. and other countries. App Store is a service mark of Apple Inc.
"Audio Frequency Analyzer" measures the input acoustic signals, and displays the frequency spectrum in 30 split bands of 1/3 octave , or in the Logarithmic FFT scale. 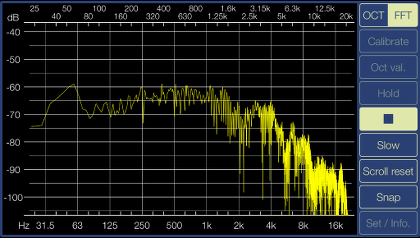 High performance software design for Real Time Spectrum Audio Analyzing. 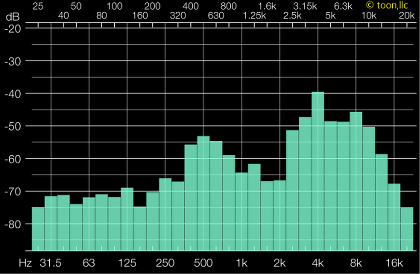 At the time of starting this app "Audio Frequency Analyzer", this topview will be displayed. All operations can be carried out in the topview screen. The access permission to the built-in microphone will be confirmed from the iOS system at the first start-up. Please enable access to the built-in microphone. The topview has Measurement Mode(OCT/FFT), Calibration(Calibrate), Measured oct value (Oct val）, Peak Hold(Hold), Start/Stop, Display response(Slow), Scroll reset, Snapshot(Snap) and Settings(Set&Info) at right side. In addition, it has the measurement display (TRACE DISPLAY) at left side. By touching scroll the screen up and down direction, you can easily change the display range. TRACE DISPLAY is the image monitor that displays the frequency spectrum measurements. The display shows the amplitude on the Y-axis, and the frequency of the 1/3 octave scale or logarithmic FFT scale on the X-axis. TRACE DISPLAY is visible in the amplitude range of 70dB. By Touch Scroll setting, you can be observed in the amplitude display area that is shifted at +30dB to -130dB. The default position is set to 0dB. By tapping "Scroll reset" button, you can return to the reference level of 0 dB. "Start/Stop" is a function to control the measurement of Frequency Analyzer. Tap "Start" button to start measurement and tap again to stop. Available to verify the instantaneous measurement results. Measurement function has two measurement modes, 1/3 octave mode (OCT), or, FFT mode (FFT). You can select a measurement mode by tapping either mode. The default is set to 1/3 octave mode. In 1/3 octave mode, you can measure the energy average value of each frequency band by frequency division in 1/3 octave x 30 bands. 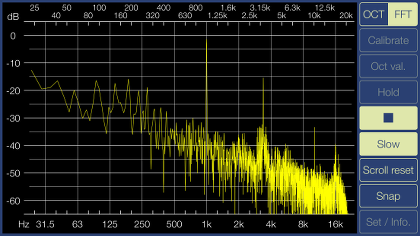 You can analyze spectrum in a specific frequency band, not the instantaneous frequency peak. It is suitable for more quantitative spectrum analysis. In FFT mode, It will perform an instantaneous FFT measurement in all measurement frequency. It can measure the instantaneous frequency peak situations, such as cases where multiple harmonics are generated. "Hold" is a display function that is held the accumulated peak level at 1/3 octave mode. In TRACE DISPLAY, the gain of each band will be displayed maximum value is always retained. In addition, it can not be selected at FFT mode. It is the display response control function. By tapping "Slow" button, Trace Display will be show the measurement image slowly. Tap again, it returns to normal response. When you tap "Scroll reset" button, TRACE DISPLAY will be initialized. Reference level of TRACE DISPLAY returns to 0dB. Please use ”Scroll reset" if you want to initialize the image display immediately or to undo the information display. "Calibrate" is a function to set the measurement offset gain. It is effective only when measuring in 1/3 octave mode. By adjusting the characteristics according to the external microphone used, high accuracy measurement can be realized. If you tap "Calibrate" button, a setting window that can be set to gain correction value is displayed. 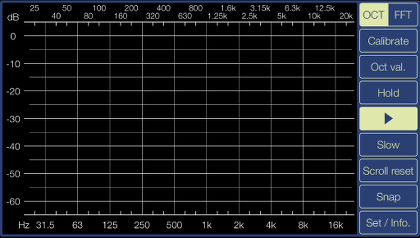 The overall level value can be set in the range of -15 dB to +15 dB. 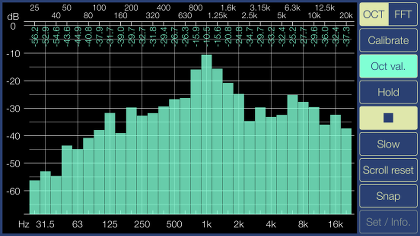 Also, the offset value per 1/3 octave can be set independently in the range of -15 dB to +15 dB. 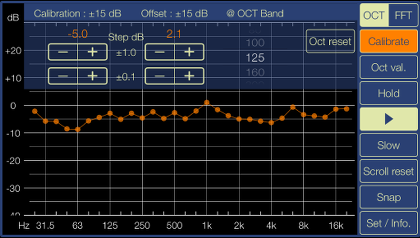 If you tap "Set/Info" button, the calibration data save settings of the offset value in 1/3 octave band is displayed. It can store two offset data and can also reload stored data. For reference, a sample model data for calibration is prepared, so please use it as necessary. By tapping the "OCT val" button, the response level for each band is displayed in the 1/3 octave band measurement, so it can assist for calibration adjustment. "Snap" is a snapshot function to save the measurement result image to the Photos (camera roll). The access permission to Photos will be confirmed from the iOS system at the first snapshot usage. Please enable access to Photos. If you tap "Set/Info" button, it will be displayed the calibration data save settings and product information. 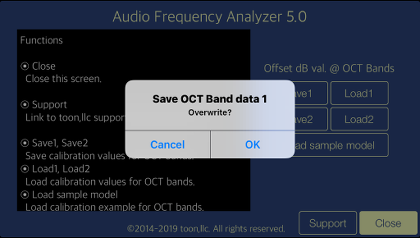 In the calibration data save setting, you can save/load two data of the offset value in 1/3 octave band. If you tap "Support" button , Safari will be started and you can view our support web page. By tapping "Close" button again, it return to the measurement view. 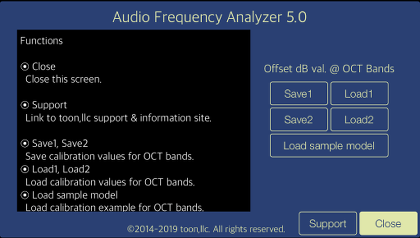 Audio Frequency Analyzer version 5.0 was released on January 23, 2019 UTC. * Correspond to iOS 12.1, Update of UI design, Improved stability. Audio Frequency Analyzer version 4.3 was released on May 21, 2018 UTC. * Correspond to iOS 11.3, Improved stability. Audio Frequency Analyzer version 4.2 was released on March 14, 2018 UTC. Audio Frequency Analyzer version 4.1 was released on February 22, 2018 UTC. Audio Frequency Analyzer version 4.0 was released on January 17, 2018 UTC. * Correspond to iOS 11.2, Update of UI design, Performance improvement. * Add the 1/3 octave band calibration function. 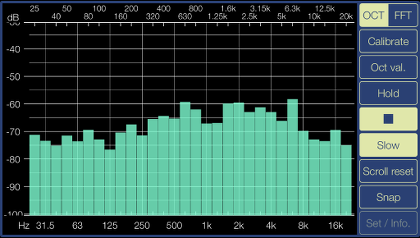 Audio Frequency Analyzer version 3.2 was released on March 4, 2016 UTC. * Correspond to iOS 9.2, Performance improvement. 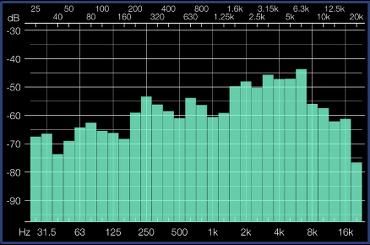 Audio Frequency Analyzer version 3.1 was released on January 16, 2016 UTC. * Correspond to iOS 8.4, Update of UI design, Performance improvement. * Add display response control function. * Correspond to iOS 8.1, Major Update. Changed UI design design, Performance improvement. * Add gain calibration function. * Improved low frequency response. * Changed UI design and App name. * Add Function of Touch-Scroll to adjust visible amplitude ranges. fo-Kannon Lite version 1.1 was released on November 27, 2013 UTC. fo-Kannon Lite version 1.0 was released on August 31, 2013 UTC. If you use an external digital audio interface via Lightning or USB interface, iOS device is input from the left channel. Please input of the accoustic signal out of the way to level-over by the gain adjustment carefully. If the acoustic signal of high level is input from external microphone (via pin jack), iOS devices might be switched to the built-in microphone automatically. It is recommended that you should adjust the microphone gain very carefully. At the time of the first access to Microphone/Photos after installing the app, you will be asked permission to access them from the iOS. If you did not enable this setting on this time, it can not be access from the app by privacy restrictions of the iOS. Please enable slide switch of the app in the access permission of the iOS setting, "Settings > Privacy > Microphone/Photos".